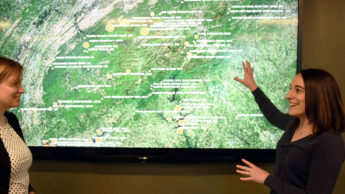 Whether you're interested in a career in geospatial analytics or would like to acquaint yourself with the field, NC State and the Center for Geospatial Analytics offer a variety of courses just right for you. 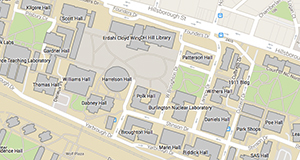 Check out classes in geospatial analytics, geographic information science, and geospatial science applications, available online and on-campus. Stacy Supak specializes in online learning and teaches half of the credit hours at the Center for Geospatial Analytics. As a DELTA Faculty Fellow, she is also investigating how experiences in online courses influence student success. Core courses are available regularly each semester to help you meet degree timelines, and a revolving number of experimental Special Topics courses introduce you to new and innovative frontiers in geospatial science. Many of our courses can be completed through Online Education as well as on-campus. We encourage students to review the course catalog each semester for up-to-date course offerings, credit hours, required pre-requisites, and other enrollment details and requirements. Current offerings are listed below. Many are core to the Graduate Certificate in GIS or Master of Geospatial Information Science and Technology. For the most up-to-date information about each course, be sure to refer to the syllabus provided to you by your instructor. Topics and schedules are subject to change. Courses offered online are labelled as DE, and courses that meet in a traditional classroom setting are labelled as classroom. Some courses have both labels.